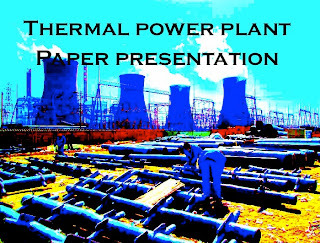 Paper presentation: Thermal power plant ~ Engineering projects ideas for final year students & paper presentations collection blog. The electric efficiency of a conventional thermal power station, considered as sell able energy produced at the plant bus bars compared with the heating value of the fuel consumed, is typically 33 to 48% efficient, limited as all heat engines are by the laws of thermodynamics. The rest of the energy must leave the plant in the form of heat. This waste heat can be disposed of with cooling water or in cooling towers. If the waste heat is instead utilized for e.g. district heating, it is called cogeneration. An important class of thermal power station are associated with desalination facilities; these are typically found in desert countries with large supplies of natural gas and in these plants, freshwater production and electricity are equally important co-products. Since the efficiency of the plant is fundamentally limited by the ratio of the absolute temperatures of the steam at turbine input and output, efficiency improvements require use of higher temperature, and therefore higher pressure, steam. Historically, other working fluids such as mercury have been experimentally used in a mercury vapor turbine power plant, since these can attain higher temperatures than water at lower working pressures. However, the obvious hazards of toxicity, and poor heat transfer properties, have ruled out mercury as a working fluid.